This article has been curated from "Sons of God Awake" by Bill Britton, a series of messages written and published earlier in booklet form, which we considered so vital to present truth that we decided to put them in permanent book form. The purpose of this book is to show the unfolding revelation of Jesus Christ in His Sons. Man is surrounded by limitations. In fact, he is a creature of circumstances, limited by time, space, human knowledge, physical strength, and endurance. No matter how desperate he is to perform a task, he can stay awake only a certain number of hours before he becomes weak and useless physically and mentally and must give in to sleep and rest. No matter how large an empire he has to rule over, he can only be at one place at a time. No matter how rich he is, or how much money he has to bargain with, he cannot buy more than his allotted time on this earth. Sometimes, due to the limitations of the physical body, even the greatest of men have to leave this earth, weeping, in the zenith of their power and authority. These limitations are imposed by divine authority. God has set the boundaries, and only by an act of God can those boundaries be crossed. Man can survive for a few weeks without food, and only a few days without water, yet Moses stayed on Mount Sinai in the presence of God for almost three months without food or water. He was sustained by divine Life. Men used to gaze heavenward and wonder what the vast universe was like. Human knowledge of the sun, moon, and stars was very limited and made up mostly of imagination, guesswork, and superstition. But this is rapidly changing in our time. Men are sending up scientific instruments to probe the heavens, making landings on the moon, and sending their cameras and radio transmitters to other planets to send back information. For more than fifty centuries this sort of thing was only a wild dream in the minds of a few “crackpots,”some of whom were jailed and persecuted for their ideas. But now it is becoming a reality. Yes, man’s physical world is undergoing a tremendous revolution. The apostle Paul said in 1 Corinthians 15: 46: “first…that which is natural; and afterward that which is spiritual.”The natural revolution is only a shadow of things to come in the spiritual. Why this sudden change in the natural world? Because it is now time for a great change in the spiritual world. In the natural, man has begun to press against the barriers that limit him. Great strides have been made rapidly in the speed of transportation since man first broke the sound barrier in the 1940s. As airplanes approached the speed of sound, violent vibrations occurred that nearly shook the planes apart. But scientists soon discovered how to engineer planes that could withstand the vibrations of the sound barrier, and once they had broken through and exceeded the speed of sound, they discovered that there was almost no limit to the speed they could attain. However, planes flying through the “heavens”faster than the speed of sound cause sonic booms that shake those living on the earth, sometimes causing fear and trembling. So also in the Spirit. Saints of God began to cry out against the “sound barrier”of men’s voices telling them how fast and far they could go with God, what they could and could not believe, and how much of the Word of God they could appropriate for today. As they approached the barrier set up by the sound of men’s voices and men’s doctrines and traditional interpretations, a shaking began to take place that nearly tore some vessels apart. But the precious Holy Spirit, the greatest engineer of them all, began to bring forth some “Sons”who could withstand the shaking and press through the barrier to a glorious liberty and release in the Spirit where there was almost no limit to the progress they could make in spiritual revelation. They were amazed at the liberty on the other side of the “sound barrier”of the voices of doubt and fear. But as the Sons progressed rapidly through the heavens in their newfound liberty, they set off spiritual “sonic booms”that terrified and upset those living on a low earthly plane of spirituality. Carnal Christians shook their fists at the heavenly travelers, called them false prophets, fanatics—even heretics—and made great attempts to slow their progress or pull them down to an earthly level. These are trying times for those who are fenced in by the limitations of the carnal mind and the sectarian sounds of man’s ways. Many on the earth level find themselves in great frustration and fearful of all heavenly activity, shaken by the “sonic booms”of sound waves from those moving through the heavens. They hover together in their little denominational shells, hoping for their traditional fairy tales to come true, while in the heavenlies, eagle saints find little traffic, but great liberty—and no fences. No longer bound by earthly sounds, they soar through spiritual heights led only by the Spirit, and hearing the voice of Him who speaks from heaven. The carnal activity of earthbound creatures interest them not at all, but they find a glorious fellowship in the mystery of God with those who soar with them in divine revelation and spiritual attainment. They cannot hear the sounds of earth, the noisy city, the busy factory, the screaming mobs, or the warring dictators. They wear a look of divine peace, for a peace is given to them that passes understanding as they refuse to take part in the frantic earthly activity of carnal men. Theirs is a heavenly calling, having broken the barrier of earthly sounds! It was a great day for scientists when they were able to overcome the pull of gravity and launch a rocket high above the earth, through the heat and friction barrier, and into the realm of space. In doing so, they had to surmount many obstacles. They had to deal with the tremendous heat caused by the friction generated by an object passing through the air at hitherto unbelievable speeds. As the rocket ascended into the higher heavens, it passed through a radiation belt, coming into contact with forces that would melt and destroy ordinary materials. Finally, it burst through to outer space where there was no friction, no resistance to motion, and seemingly absolute weightlessness. Its speed and altitude compensated for the pull of Earth’s gravity, which seemed to have no more attraction for it. Let me tell you, dear ones, that there are people right now being brought by the Spirit into heavenly realms where powers of darkness are setting up terrific forces to try to destroy them. But, thank God, these are not made of “ordinary substance.”They are called and ordained of God, anointed by His Spirit, and lifted by divine energy into realms never before attained by Adam’s race. To say that there is great opposition to their ascension is putting it mildly. Tremendous heat and friction are being generated by powers of darkness in a desperate warfare against the Sons of God who are ascending into realms long held by satan. Thrones are being cast down, the powers of heaven are shaking, and great fear pervades satan’s kingdom. The hordes of hell have not known such a shaking since Jesus arose from the grave and ascended into the heavenlies, defeating every power of the enemy, and putting satan to an open shame. Now is the time; the generation is here for the consummation of the battle of the ages. Overcomers and saintly warriors of all ages who defeated the enemy by faith in other realms are now awaiting the final thrust…the breakthrough into an unlimited realm in God! Overcomers and saintly warriors of all ages who defeated the enemy by faith in other realms are now awaiting the final thrust…the breakthrough into an unlimited realm in God! The Hebrew children, Shadrach, Meshach, and Abednego, were bound and cast into a furnace of fire. When they went into the fire they were bound and limited by their bonds. But when they came forth from the furnace, they had no bonds. Their limitations had burned away, while their persons and their clothing suffered nothing from the fiery trial. When they came out of the fire, they were promoted to a place of great authority in the kingdom. Psalm 78: 41 states God’s indictment against rebellious Israel in the wilderness: “they turned back and tempted God, and limited the Holy One of Israel.” Folks, there is no limitation with God. He has no boundaries. Furthermore, he is bringing forth a new creation and setting up a holy nation, a peculiar people in His own image and after His likeness. He is not “trying”to do anything; He is simply doing it. There is no limitation to His ability, and this glorious work will be completed right on time! Think of it…a people dwelling on the face of the earth in the image of God, with no limitations. Sure, I realize it’s hard to believe, but the Word of God declares it, and I hereby declare it to be so. The sound of them has gone throughout the earth. Too long carnal man has limited God. “He can do this, but He can’t do that.”He can let us die and take us to a beautiful heaven in the sky, but He can’t empower us to overcome death and have a perfect unlimited church right here in this life. So they say. But I declare to you that the day has arrived for the fulfillment of the promises of God and the prophecies of the prophets who saw this day coming…a people dwelling on the face of the earth in the image of God, with no limitations. Click the image below to shop the eGen store. 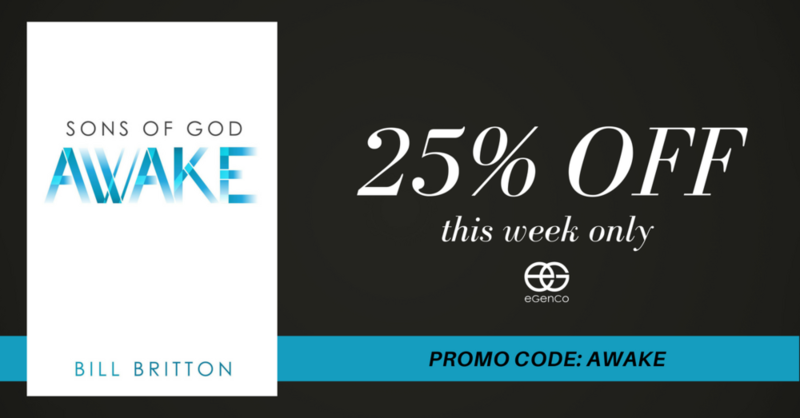 This week (1/9/17-1/14/17, 11pm EST) you will receive 25% off your purchase of "Sons of God Awake" by Bill Britton when you use promo code: AWAKE.